In the early days of the bike, more engineering-minded owners took to opening up the stock exhausts in search of more performance – and a better ‘soundtrack’. 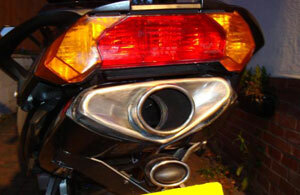 Both the pre-silencer and the underseat silencer have been subjected to this treatment with mixed results. The pre-silencer can be opened up and the catalytic converter removed, but some who did this were not impressed with the results. Two owners that I know of have modded their endcans themselves and it has to be said that this is a job that demands a skilled hand. Both documented their work step by step on the Apriliaforum.